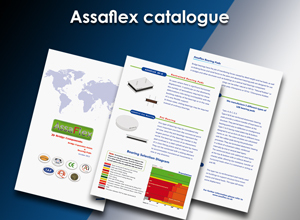 When designing the Assaflex RE, the issue of weight of the units and handling the units has been the foremost issue, hence the modules are produced in 1m lengths, with the exception of RE361 which is 1250mm in length. Another feature is the Number of fixings which is.5 per side of each module, in total 10 fixings per module. All are designed to DIN standards. In this design the module is reinforced in five areas and movements are distributed in four points utilising a Double Upper Steel. As well as the products listed in the above chart, we are able to manufacture customer specific designs to meet the exact needs of our clients. Assaflex have reduced the component count and simplified installation by combining drainage and the damp barrier in one innovative product. This takes the form of a 2mm thick membrane. This sits immediately below the expansion joint preventing the passage of moisture and forms a drainage channel.Effective length of the membrane sections are all 1m plus an overlap allowance, except RE361 which is 1250mm plus the overlap allowance. Width of this membrane varies according to the module type. The Damp Barrier & Drainage membrane can be used with RE & EMR products. A key issue when installing Expansion Joints or placement of Neoprene bearings is the unevenness of the concrete bedding / deck. This is normally dealt with by using grout and involves time and labour cost. Our parent company Assamrof have introduced a cost effective rubber membrane that is a reinforced elastomeric layer. Tough, yet flexible enough to follow the concrete contour, hence forming one single unit and removing the need for grout. By employing this bedding strip technology, a single team is able to carry out the installation in one cycle with a resultant increase in productivity. The client saves time and money. The thickness of each bedding strip is 10mm. The number of bedding strips employed is determined by the concrete surface. Most applications require no more than 5 layers - 50mm.The bedding strip is used with RE & EMR expansion joint products. The bedding strip can be used instead of grout under bearing pads. Anchor bolts are fixed to the concrete using adhesive resin. On completion of the installation the ordinary bolts are removed and secure bolts are used as a permanent feature of the modules. To complete the installation, a Polymer based mastic is used to form a seal between the modules and the tarmac. The following table shows the specifications that ASSAFLEX RE expansion joints are produced to. The expansion joint modules are mechanically fixed by use of bolts adhesively anchored to the bridge deck or the abutments allowing the horizontal stresses to be transmitted through friction between expansion joint and the concrete.